This article is about the city. For the regency, see Tangerang Regency. Tangerang (Sundanese: ᮒᮍᮨᮛᮀ, Chinese: 丹格朗) is a city in the province of Banten, Indonesia. Located on the western border of Jakarta, it is the third largest urban centre in the Greater Jakarta metropolitan area after Jakarta and Bekasi; the sixth largest city proper in the nation; and the largest city in Banten province. It has an area of 164.54 square kilometres (63.53 square miles) and an official 2010 Census population of 1,797,715, increasing to 2,001,925 as at 2014 – making it the eighth most populated suburb in the world at the latter date. Tangerang, along with South Tangerang, is where many giant developers created built-up areas such as BSD City, Gading Serpong, Alam Sutera, and Lippo Village. Tangerang is home for Soekarno–Hatta International Airport which serves Jakarta metropolitan area and as the Indonesia's main gateway. Indonesia Convention Exhibition is the biggest convention and exhibition centre in Indonesia opened in 2015. In recent years the urban expansion of Jakarta has covered Tangerang. As a result, many of its residents commute to Jakarta for work or vice versa. Many high-class and middle-class satellite cities have been developed in Tangerang, complete with their own shopping malls, private schools and convenience centers. The government is working on expanding the highway system to accommodate more traffic flow to and from the area. Tangerang is the corporations' alternative to move or build their offices from Jakarta due to the heavy traffic and crowds, such as Unilever Indonesia that moved their head from Jalan Jenderal Gatot Subroto, Jakarta to BSD City. A traditional Cina Benteng wedding ceremony. Majority of Tangerang Citizen are Sundanese, in which they are the origin in here. Tangerang has a significant community of Chinese Indonesians, many of whom are of Cina Benteng extraction. They are part of the country's Peranakan Chinese community, but with deep, centuries-old roots in the historic Tangerang area, also called 'Benteng' locally. Most of the old settlements in Tangerang have colonial, Chinese districts, such as at Sewan, Pasar Lama, Pasar Baru, Benteng Makasar, Kapling and Karawaci Lama (the precursor to Lippo Karawaci). One can find any food and all things Chinese there. In addition, a large proportion of Benteng Chinese have traditionally been rural dwellers, engaged in agricultural activities, such as farming and livestock production. Due to the growth of satellite towns in the greater Jakarta region, which includes Tangerang, the area is now home to many new migrants from all parts of Indonesia. In October 1945, Laskar Hitam, a Muslim militia, was established in Tangerang. The goal of this movement was to establish an Islamic nation in Indonesia. This movement later became a part of DI/TII rebel group. On October 31, 1945, Laskar Hitam kidnapped Otto Iskandardinata, Republic of Indonesia's Minister of State. He was presumed to have been murdered at Mauk beach, Tangerang on December 20, 1945. Tangerang city was formed as an autonomous city on 27 February 1993 out of the Tangerang Regency. The city was previously an administrative city in that regency. In August 1996, Walmart, the largest retail group in USA, opened its first branch in Lippo Karawaci, Tangerang. The branch was ransacked and burned down during the Indonesian riots of May 1998. Walmart discontinued their investment in Indonesia after the riot. Tangerang District is the location of the Situ Gintung reservoir built by the Dutch colonial authorities in 1933. It was surrounded by a dam up to 16 metres (52 ft) high, which failed on 27 March 2009 with the resulting floods killing at least 93 people. Boen Tek Bio is the oldest Chinese temple, or klenteng, in Tangerang – with a history going back to 1684. Next to Boen Tek Bio is the Benteng Heritage Museum, a historic townhouse that was restored and repurposed as a museum by a Benteng Chinese businessman Udaya Halim. It was opened on a specifically chosen auspicious date: November 11, 2011 or 11/11/11. The museum displays Benteng Chinese artefacts and other cultural objects related to the history of Tangerang's Chinese community. The city of Tangerang is divided into 13 districts (kecamatan), tabulated below with their 2010 Census population. By 2007 the city government passed an anti-prostitution law which meant that women who are perceived to be dressed too provocatively may be arrested. Some news outlets reported that some women decided to wear jilbab (hijab) to avoid being prosecuted under this law. In addition the city government began requiring municipal employees to abide by Islamic dress codes. South Tangerang (Tangerang Selatan) is a city which, like Tangerang city, is administratively separate from Tangerang Regency. It is subdivided into seven districts – Serpong, Serpong Utara (North Serpong), Ciputat, Ciputat Timur (East Ciputat), Pondok Aren, Pamulang, and Setu. Located on the southwest of Jakarta, it has an area of 147.19 square kilometres and a population of 1,303,569 at the 2010 Census. Tangerang provides educational facilities from kindergarten to college. BSD City is the pioneer of Tangerang's first education centre called EduTown which now consists of two universities. In addition to government schools, there are many private schools and colleges. Among these are Sekolah Santa Ursula BSD, Santa Laurensia School, BPK Penabur Gading Serpong, and IPEKA Plus BSD Christian School. Tangerang's economy depends highly on service sectors, trading, financial service, and industrial. Jatake, which is Tangerang's biggest industrial area, is home to over 1,000 industrial corporations. As the impact of Jakarta's growing economy, Tangerang has become an alternative for some corporations to build their offices here due to crowds and land prices. Jl. Pahlawan Seribu and Jl. Kapten Soebianto Djojohadjikusumo which are in BSD City are the central business district for Tangerang city and South Tangerang. Hundreds of shophouses and several important branch office and headquarters are here. Tangerang is the home for shopping in Banten area. Numerous shopping centres and markets are available here. The largest shopping mall in Tangerang and Banten is Supermall Karawaci in Lippo Village which provides H&M, Debenhams, and more. The most popular is AEON Mall BSD City which opened in May 2015 as the first AEON mall in Indonesia; it has an AEON Store and high-street brands such as H&M and Uniqlo. Mall @ Alam Sutera is an upper-middle class shopping mall consisting of high-street brands such as Cotton On, New Look, Dorothy Perkins and Sogo department store along with TheFoodhall Supermarket (part of PT. Panen Lestari Internusa). Other popular destinations are Summarecon Mall Serpong, The Breeze BSD City (open-air mall), Living World Alam Sutera, TangCity Mall, TerasKota, Ikea, The Hu6 (Balekota), WTC Matahari, BSD Plaza, ITC BSD, Bintaro Plaza. There are two highway connections from Jakarta. First, the Jakarta–Merak highway, which has three exits points to Tangerang city. Second, Bumi Serpong Damai–Jakarta Outer Ringroad highway provides direct toll access from Tangerang, Jakarta, Bekasi, and Bogor. The feeder buses of Transjakarta serves commuters from Bumi Serpong Damai and Bintaro Jaya. KRL Jabotabek serves from Tangerang and Serpong to Jakarta Kota. For the Indonesian A1 Grand Prix in November 2008, the government developed Lippo Karawaci circuit. There are several taxi companies operating in the city, such as the express taxi, blue bird, and the local operator Arimbi. 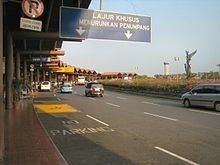 Soekarno-Hatta International Airport is the main hub for air transport in Jakarta Metropolitan Area as well as Tangerang. Air-conditioned public bus shuttle is available from the airport to destinations in Jakarta. This is operated by DAMRI, a state-owned company. There are private shuttle bus services from Jakarta to private residential area such as Lippo Karawaci and Citra Raya. There are 17 intersections prone to traffic congestion with the obsolete Multi Program Eight Phase System. By 2012, Tangerang will have a new technology, called the Intelligent Transport System (ITS), that uses a closed-circuit camera that responds to traffic conditions at any given intersection and could reduce the rate of congestion by 30 percent. ^ Setiono, Benny G. (2008). Tionghoa Dalam Pusaran Politik (in Indonesian). TransMedia. ISBN 9789797990527. Retrieved 8 March 2018. ^ Lestari, Sri (16 February 2018). "Ketika warga miskin 'Cina Benteng' merayakan Imlek". BBC Indonesia. Retrieved 8 March 2018. ^ Singh, R. B. (2014). Urban Development Challenges, Risks and Resilience in Asian Mega Cities. Springer. ISBN 9784431550433. Retrieved 8 March 2018. ^ "Evakuasi Hari Ini Dihentikan, Jumlah Korban 93 Orang". Republika (in Indonesian). 28 March 2009. Retrieved 2009-03-28. ^ User, Super. "Boen Tek Bio – SEJARAH". www.boentekbio.org. Retrieved 8 March 2018. ^ 'An encounter with history,' The Jakarta Post. ^ Mutia Nugraheni (February 11, 2015). "Mengenal Museum Peranakan Tionghoa Satu-satunya di Indonesia". ^ Warburton, Eve (January–March 2007). "No longer a choice" (89 ed.). Inside Indonesia. Retrieved 2017-06-20. ^ Post, The Jakarta. "Tangerang goes hi-tech in traffic". Wikivoyage has a travel guide for Tangerang.